Democratic Rep. Ilhan Omar (MN) recently minimized the September 11, 2001 terror attack on U.S. soil that killed 3,000 people. Al-Qaeda terrorists flew planes into the World Trade Center in New York City, the Pentagon, and were about to crash another aircraft until the heroic passengers of Flight 93 thwarted the terrorists' efforts and downed the plane in a Pennsylvania field. Astoundingly, Omar referred to these events as "some people who did something." Most Americans were outraged at Omar's description. But people like Nancy Pelosi are more offended by a tweet. 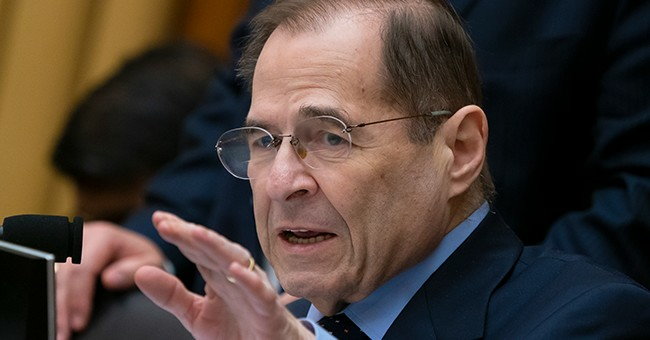 Now, we have Rep. Jerry Nadler (D-NY) telling Jake Tapper he has "no problem" with Omar's remarks, explaining that the freshman was just trying to note how people used 9/11 as a means of discrimination. "She characterized it only in passing," he explained. "She was talking about discrimination against Muslim Americans. And she just said after that happened, it was used as an excuse for lots of discrimination and withdrawal of civil liberties." "I've had some problems with some of her other remarks, but not with that one," he added. Pelosi protected Omar in this scandal too. When it came time to vote for the anti-hate resolution spurred by her anti-Israel remarks, Omar complained that her prejudice was being singled out. So, Pelosi agreed to expand the measure to include all forms of bigotry and hate. Aware of the Democrats' attempt to sweep Omar's language under the rug, President Trump concluded they were now the "anti-Israel party."